Chou Chou! Adventures of a Briard Girl : SnowChou! 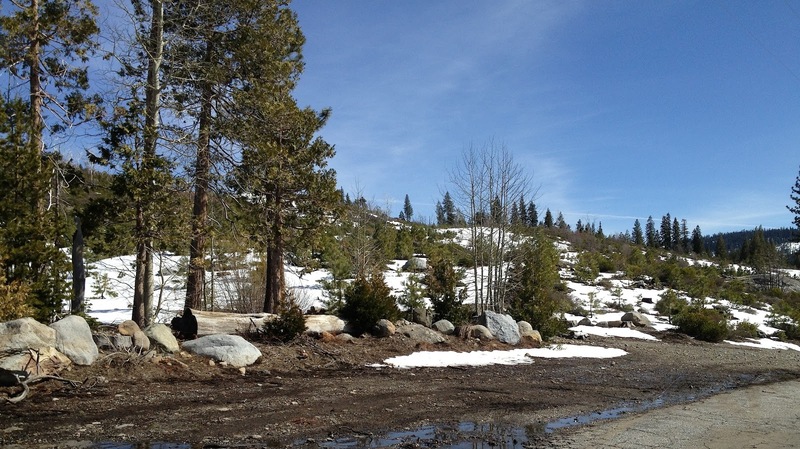 It was a beautiful, warm day in Sacramento -- a great time for a road trip, with a friend, to the snow! This was the first time Chou Chou saw snow. I have wanted to let Chou play in snow for a long time. 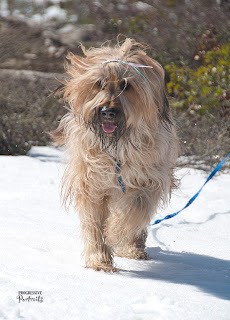 I am on a briard listserv, with briarders worldwide, and all winter they have shared beautiful photos of their briards playing in snow. The briards look so happy. So today I put Chou in the car, picked up a friend for company, and off we went to the Foothills, about an hour from Sacramento. For me: winter coat, scarf, gloves, heavy socks, snow boots, sunglasses. For Debbie: a breakfast scone. For Chou Chou: treats, a chew toy for the car, her orange Frisbee for the snow, cold water to drink in a Gulpy, a thermos full of warm water and a bowl to wash ice or salt off her paws if needed, Vaseline for her paw pads to minimize snow or ice sticking, towels, and a 30 ft. drop leash so she could play on leash but have freedom to romp. 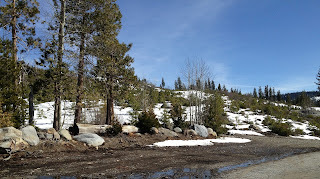 We didn't know exactly where we were going; we just drove up 80-E into the Foothills, until we saw snow by the side of the road, then took an exit at Yuba Gap. We parked the car by the side of a road, with no one around, and let Chou Chou out. Although I saw all the happy briard snow photos, I really didn't know what to expect with Chou. When I told a friend I was going to do this, he laughed, "How do you know she'll like it?" He told me how he brought his Alaskan Malamute to the snow and the Malamute hated it! But Chou got right out of the car and went into the snow. At first she tiptoed gingerly. 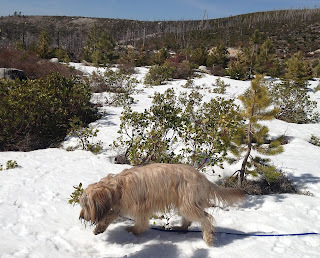 But very quickly she found something good about snow: it's edible. ("A nice cold drink!") She did this for quite a while, leaving paw prints and tongue prints as she went. Chou got braver, and played with my friend. Rather than go off on her own, Chou stayed close to Deb. ("I'm a herding dog!") She is a professional photographer ("And sometimes my pet sitter! ), and you can see her photos of young Chou Chou on this blog, along with the featured photo for this post. That's what I love about Northern CA = you are never far from an outdoor adventure!